It can be difficult to truly engage an audience. Conferences, trade shows, events, and conventions are filled with content and it's difficult for most to get their message to stick. When you book Eric Pratt for your event those problems are solved. Eric's one of the most engaging people you'll ever meet. His upbeat, no-nonsense, straight-to-the-point delivery never disappoints. Whether he's talking about leadership, team development, digital marketing, or sales enablement, your audience will leave with a smile on their face and actionable next steps for implementing the concepts he presents on. Inquire on the right for availability and booking. Preparing business leaders with the big-picture understanding needed in order to lead sales and marketing efforts in our digitally distracted world. 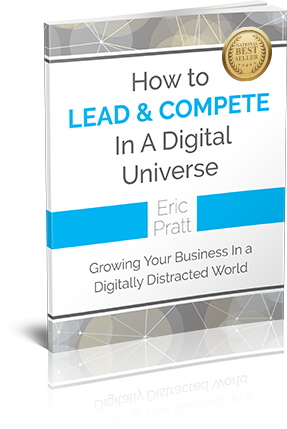 How to Lead & Compete in a Digital Universe lays out the components for a hyper-digital strategy to help organizations compete for new business in the places their prospects frequent. By understanding our complex marketplace, mobile landscape, and need for instant gratification you'll be prepared to lead the organization towards a successful set of strategies and tactics to help you compete in our digital universe.